this annual underwater spectacle is one not to miss! 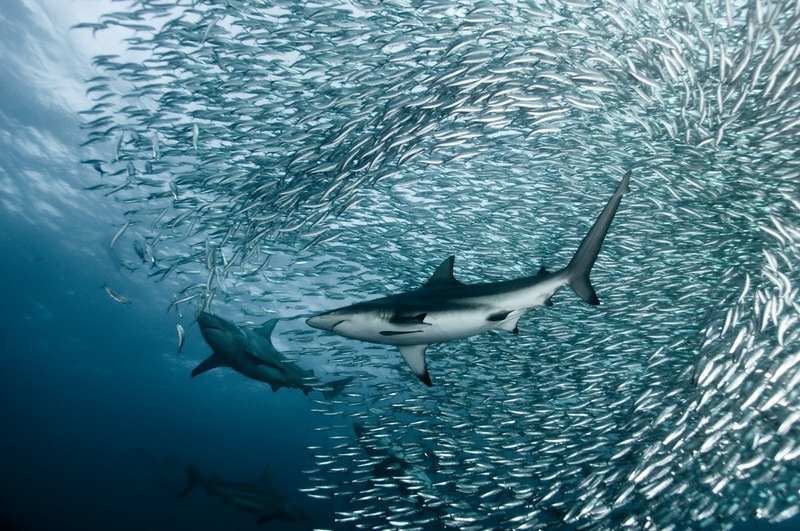 Escaping the cold waters of the Cape, thousands of sardines head north hugging the coastline of southern Africa, making their way up to KwaZulu-Natal. They’re following their food source, which is being driven north by the currents; more of an extended range than a migration. This, is the famous Sardine Run. These massive shoals (up to 40 metres deep and 9 miles long) are a spectacle in themselves, but it’s enhanced by the hundreds of predators arriving on mass for their feeding frenzy. 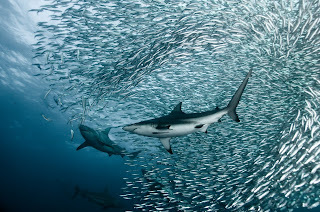 The extravaganza includes birds, dolphin, sharks, game fish and whales, all there for their fast food fill of sardines. To witness part of this would be an amazing feeling; would you know where and what to look at? We look forward to feedback from our clients who have visited recently and witnessed this amazing wildlife event. For now, let’s catch up with Shona’s (ScubaAddicts) recent report on underwater action from their base in Port St. Johns, right in the thick of things! “The sardine run has been amazing this year, definitely one of our best ever. Loads of bait balls, amazing whales breaching, double breaches i,e. with two whales breaching at the same time. Lots of great sharks, copper sharks, dusky sharks and bull sharks. The gannets have been putting on a great show diving through the bait balls, whilst the dolphins have been working the bait balls and keeping them around for long periods of time. To top it off we have had many sightings of sail fish with the bait balls. The action is not very far out to sea, it is all within our limits to where our boats can go. Sometimes it is all happening just outside the river other times we travel around a lot more”. Sardine Run packages are available in June and July. Of course, there’s still time to head over this year, but if you’re looking for a Sardine Run experience in 2014, we recommend booking soon. It’s extremely popular! These dive adventures can be booked through Dive Worldwide. What’s more, as the focus is on sharks, they are part of our ‘shark infested’ programme, helping raise vital funds for Bite-Back throughout 2013. Email or call 0845 130 6980 to book an adventure of a lifetime.